The Nahant Fire Department said the power outage occurred in the Little Nahant area after a truck with an elevated bed turned a corner and snagged some wires, bringing down the pole. 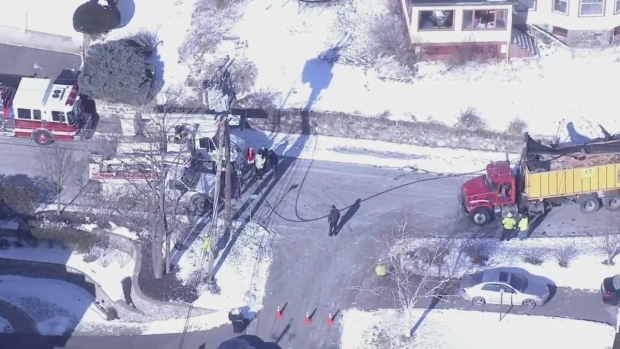 Power has been restored after hundreds of residents in Little Nahant, Massachusetts, lost power Thursday morning when a truck downed a power line, causing an outage and extensive damage. "I heard a thwack-a-thwack-a-thwack-a-thwacka," said Little Nahant resident Bonnie Bishop. "I looked up quickly and saw the tail end of a yellow truck." "I just watched the construction truck lift up the thing that puts the tarp on the back and then he didn’t put it back down and I watched as he took down all of the wires as he was driving down the street," said resident Suzanne Macarelli. Residents in Little Nahant, Massachusetts, were asked to shelter in place Thursday morning after a downed power line caused an outage and extensive damage. 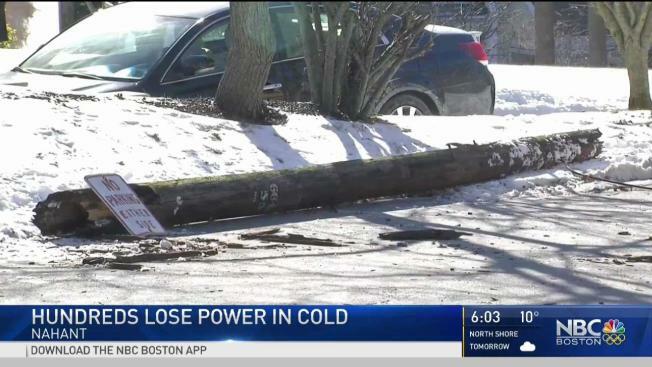 No one was injured, but according to town officials, about 1,000 people were without power in the area amid bitter cold. "It’s cold! My house was nice and warm and cozy and it just – now it’s cold, the heat is off and it’s cold," said Marie Petrecci of Little Nahant. "We’ve been doing several well-being checks as we’ve had family members showing up to check on their loved ones," Nahant Fire Chief Michael Feinberg said. Some people sheltered at home, running the faucets and bundling up. The town set up a shelter at the nearby Johnson School. “The best thing to do is come down here for a while, get warm, or go to somebody else’s house," said Assistant Director Of Emergency Management Mike Halley said. But most people chose to go stay with family or friends. "Hanging out with my mom at the nursing home playing cards," said Macarelli. Officials say the road is still shut down because they’re still waiting for Verizon and Comcast to come and repair their wires.